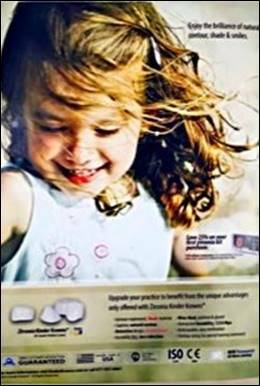 A manufacturer of dental crowns for children that produced three ads for its product mimicking those of a competitor—one of which included the same shot of a little girl at the beach, plucked from the iStockphoto.com website—cannot be liable for trade dress infringement where the original ads lacked uniqueness, the Ninth U.S. Court of Appeals has held. “[N]one of the trade dress at issue is inherently distinctive,” a three-judge panel’s memorandum opinion, filed Wednesday, declares. The opinion affirms a partial grant of summary judgment by District Judge Kimberly J. Mueller of the Eastern District of California in favor of defendant Mayclin Dental Studio, Inc., a Minnesota corporation. It was sued by EZ Pedo, Inc., a California company, which claims that its rival appropriated the “look and feel” of its ads. 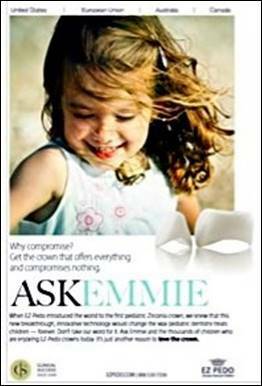 “The Beach Girl trade dress consists of information about EZ Pedo, descriptions and illustrations of its product (pediatric zirconia crowns) and a picture of that product’s ultimate user (a child),” the opinion says. That, it proclaims, does not qualify for protection. Mueller also found that there is no protection for an EZ Pedo ad that pictures mechanical gears or one depicting a computer aided drawing (“CAD”) of a tooth, colored blue. He said the defendant utilized such an image to market a “very, very niche product” which was “the exact same thing” that the plaintiff was selling. Fraidenburgh stressed that what was at hand was a “look and feel case” and that, under precedent, it was necessary to examine the overall effect of the images. Rather, he said, trade dress relates to labels, containers, and the like. Pressed by Tashima as to whether “advertising can never” constitute trade dress, he acknowledged that such a proposition “might be a bit of a stretch,” pointing to a case in which cigarette advertising featuring the “Marlborough Man” was held to be protected. But that case, he noted, entailed a secondary meaning, acquired over a 20-year period. A fourth copycat ad by Mayclin was not addressed by the motion for partial summary judgment and remains to be dealt with by the District Court. The cause of action for a copyright violation involves a photograph of a girl in lavender dress which was not a stock photo, but was one taken by EZ Pedo. The case is EZ Pedo, Inc. v. Mayclin Dental Studio, Inc., 18-15806.